In the mid-60s we were living in Hong Kong – my Dad was helping to start a missions hospital for refugees there. I was six. We heard that Princess Margaret and Lord Snowden were coming for a state visit, and we ran to the street to see them drive by. I couldn’t wait! From my story books, I knew exactly what a princess looked like: she would wear a sky-blue, glittery gown and a tall cone-hat with streamers. Her coach would be led by prancing horses . . . I was beside myself, waiting to see her. To this day I remember the shock I felt when the royal couple drove into view. Margaret wore a plain brown dress and matching pillbox hat and gloves. She sat in the back of a plain black car and waved a little parade wave as she passed. She was ordinary, just like anybody’s mom! I felt sick. I didn’t know what to think. I just wanted to go home. I wonder if this is how some of the Jews felt in Jerusalem, the week after Jesus’s triumphal entry? They couldn’t wait to welcome the messiah, and they knew just what he’d be like. When Jesus called for a colt as he approached the royal city, he was fulfilling the messianic prophecy of Zechariah 9:9. The people gave him a royal welcome, throwing down their cloaks like a red carpet and waving palm branches and shouting Hosanna! for joy. Not a week later, Jesus continued on his way while people spat instead of waving palms and hurled insults instead of praise. And instead of hailing him as king, they called out, Crucify! These people had not imagined a messiah who could be rejected by the religious leaders, brought up before Rome on trial and condemned to death. They could not see how through the cross he would deliver them from something worse than Rome and then rule forever from heaven. They didn’t recognize him, so they couldn’t receive him. Would we recognize him, if Jesus came today? Because as much as we love him, it’s easy to dress Jesus up in our minds like I did with Princess Margaret, all those years ago. We want a knight on a white charger to sweep us off our feet. We struggle with broken families … addiction … unfair bosses … financial burdens … illness. We know he can heal, so we expect him to heal us of everything, now. We want him to be nice and forgiving to us and to judge everyone else. We want to put the cross behind us, rather than following him there; we don’t want to lift our own crosses and take them along. We’re like Peter, who when Jesus said he would suffer and die, rebuked the Lord. No way! he said. That can’t happen. To which Jesus said, Get behind me, Satan. You’re holding me back. At mass on Palm Sunday after we sing Hosanna! and wave our palms, the Liturgy of the Word will carry us into the Passion. 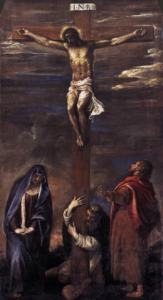 And we will recite, out loud, the crowd’s part in the drama: with our own voices we will accuse Peter; we will jeer at Jesus on trial; we’ll reject him as Son of God, call for his crucifixion, and taunt him on the Cross. Just as so many others did, that long-ago day. It is a good day to consider, as we head into Holy Week, just who it is we are welcoming into our hearts and lives. Are we ready to follow him to the cross, like the Beloved Disciple; like Mary and the women who loved him? 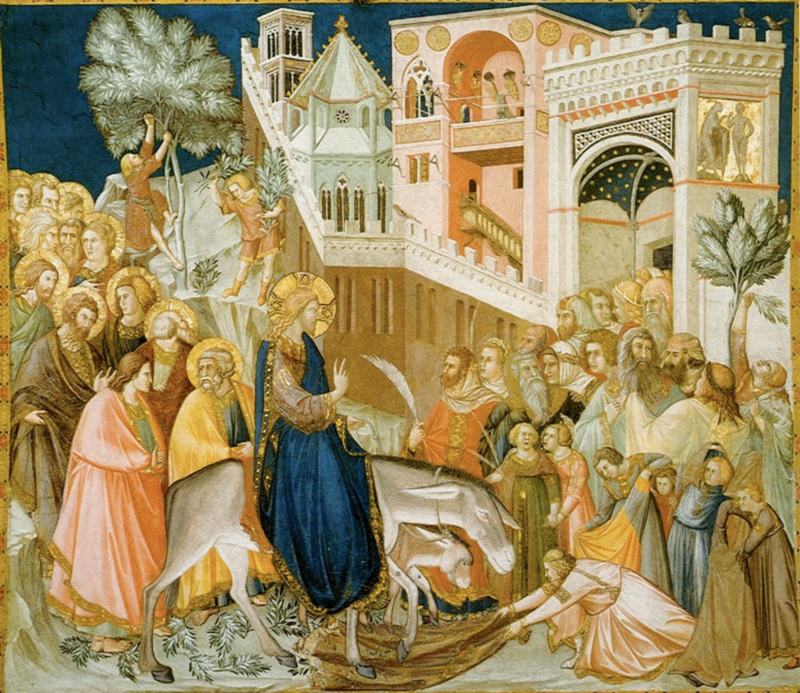 that he entered his own city of Jerusalem. we may have a share also in his Resurrection and in his life. May our Lord bless you and yours richly this Holy Week.